It’s been a drop-me-to-my-knees kind of week. More than once, I’ve looked upward and cried, “Uncle. Uncle. Uncle.” I’m not what anyone would call a religious person, but I am spiritual. I believe unequivocally in God — whatever He or She might look like. And this week, I have been begging for mercy, for guidance, for peace. I’ll not bore you with the specifics. Crazy, I know. The one who is classically known for over-sharing is choosing to remain somewhat tight-lipped on this one. The details don’t matter. The outcome does. This week has been ruled by fear, by loneliness, by desperation. And as my beloved JG says (and which you’ve all heard before), “Fear is incapacitating and weak and serves no purpose.” I get it. This week the part that I really got was the “incapacitating” part. I was stuck. Completely mired in it. Add to that a large helping of loneliness, and I was a recipe for disaster. (And I don’t even cook…) Much of the time, I am content here in the south, at peace, forward-moving. I relish the quiet, the slower pace, the time to write and read and spend time with those who mean the world to me — Chris, Sam, Gus, Mary Claire, and George. Every once in awhile, however, I am a woman without a country, an island in the middle of nowhere. Loneliness is a funny thing. Because ultimately, no one can take it away from you. Only you can settle into the comfort and familiarity of your own skin. Only you can realize that you are enough. Even more than enough. As KT Tunstall so eloquently croons, “Everybody sails alone, oh, but we can travel side by side.” And thank God for those who are traveling with me. My friends saved me this week. You know who you are. Even when I couldn’t talk, even when the words were caught in my throat and all I could do was cry, even then they stayed on the phone and listened. Even when all they heard were the unattractive gasps of undefinable sadness, they stayed. And everyone knows I’m a crier. I’m a tenacious crier. I can cry like no one else I know. Along with memorizing song lyrics and shooting 3-pointers and out-spelling everyone within a 100-mile radius and drag bunting, it’s one of my most highly-prized skill sets. When I’m there, Chris bears the weight of my tears. He comforts, cajoles, reminds me of who I am — to him, to the kids, to myself. He is good that way. He is constant and true. He loves me unconditionally even when I drag him through my crazy. We all go through these times in our lives. If we didn’t have them, we wouldn’t grow. But when you’re there — when you’re trying to claw your way out, when you’re ready to raise the white flag, when even the next tiny step seems insurmountable — it’s a scary, dark place. Yesterday, at the urging of my loved ones, I forced myself to take that step. To get dressed, put on make-up, and enter the land of the living. I very deliberately drove to McAlister’s Deli for some comfort food. Calories and carbs be damned, I ordered exactly what sounded good… chicken tortilla soup, bacon-loaded baked potato, toffee cookie, iced tea. I have to admit that the atmosphere was a bit overwhelming. The lights were bright, the conversations loud. But I carefully chose a booth in the middle of the action. I sat down, opened my book, and I breathed. And then I read. And when my food came, I ate. I savored each bite, took my time, experienced the chewing, the swallowing. When I was done, I read some more, drank more tea, took my time, re-focused my energies. Simple, I know. Silly, almost, in a way. People eat. They read. It’s not a life-changing event. But for me, it was. It was a step out of the sadness and fear yesterday. A baby step. There are many others ahead of me. And I will take them one at a time. No one said life would be easy. No one said it was sunshine and unicorns and roses. And yet, when things get bad, they can so easily spiral downward. Getting back up is a choice. And it’s not always an easy one. Sometimes the fetal position feels very much like home. But no one can stay there forever. And as my sweet Mary Claire reminded me, “Mom, you really need to stop crying before Aunt Deby and Uncle Mike get here.” When your 11-year-old speaks such words of wisdom, it’s criminal not to listen. Thank you, Mary Claire. Thank you, Chris. Thank you, Sam, Gus, and George for being funny and irreverent and patient. Thank you for continuing to argue and fight and be obnoxious in the midst of our not-so-fun realities this week. Thank you, dear friends, for being with me — even 550 miles away. 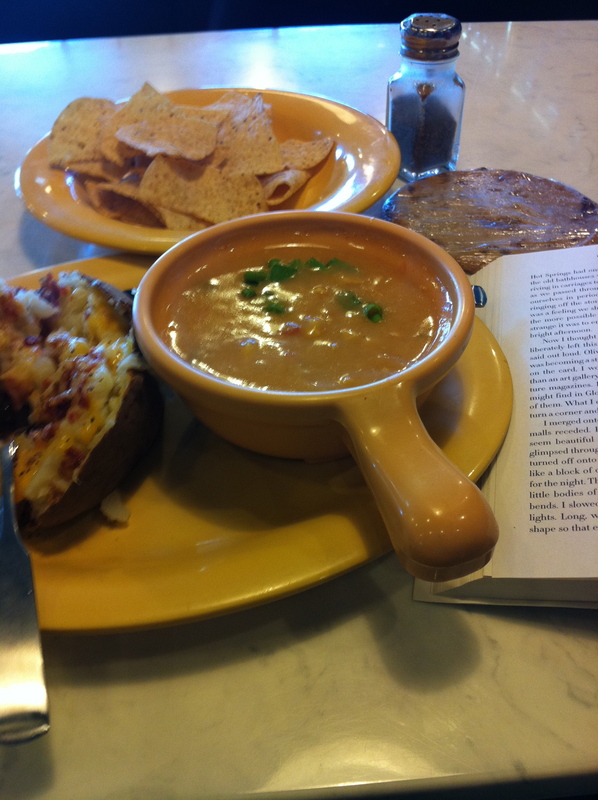 This entry was posted in Big Thinks, Help From My Friends, Man Of My Dreams, Me Myself And I, My Kids and tagged a good book, baby steps, chicken tortilla soup, crying, fear, God, iced tea, loaded baked potato, loneliness, McAlisters, moving forward. Bookmark the permalink.